My friend Carolyn is an amazing high school English teacher. Anyone who can teach MacBeth to tenth graders is a miracle worker. She is also the mom of two picky eaters; big hungry male picky eaters. 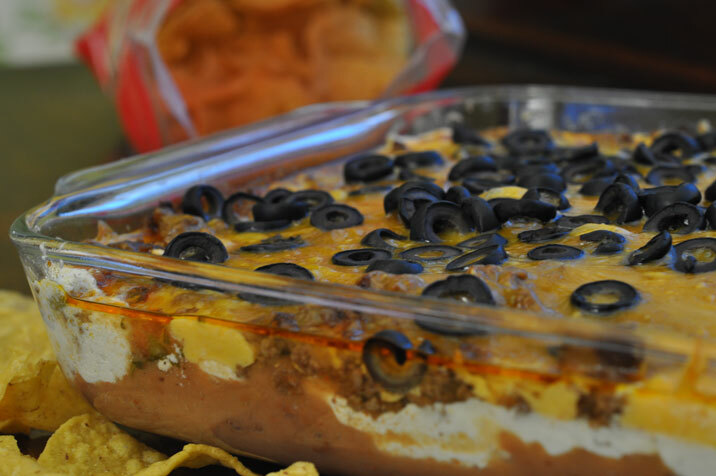 Hot layered Mexican dip is a quick meal she makes that they will actually eat. It’s different from a typical mexi-style dip in that it is heated, so it feels like a meal….served with a salad, it’s a complete meal. Fry the ground beef up and season with the taco seasoning per the seasoning directions. Set aside. Spray the bottom of a 15x10 inch baking dish with Pam. Spread the refried beans on the bottom. Spread the sour cream on top of the beans. Spread the salsa (or chopped up tomatoes if you don\'t have any salsa) on top of the sour cream. Spread the prepared meat on top of the salsa. Spread the cheese over the top of the meat. Top with the olives and sliced green onions if desired. Bake at 350 degrees until hot and bubbly - about 20 minutes. Garnish with avocado and cilantro if desired & serve with tortilla chips. Snohomish, WA is where you’ll find me, architect mom,”drafting a life”;working from home as an architect, managing my family’s lives, forgetting to clean the house, building some crazy thing or another, sometimes cooking a great meal and always packing my kids horrible lunches. Blimey, Eat Your English Tea Sandwiches! Lucky Seahawks Pie with Fortune Cookie Crust aka Blueberry Cream Pie. Go Hawks!